Dubai’s population in 1975 was 183,200. Today it is about 1.67 million. The travel time from New York City to Dubai is 12 hours, 30 minutes. About 15% to 20% of the world’s cranes are currently operating in Dubai. Burj Al Arab, a seven-star hotel, (pictured right) is the tallest offshore structure in the world. The Burj Dubai tower under construction already is the world’s tallest building, and it’s final height is still unknown. The developer hasn’t yet announced what it will be for fear a competitor will try to top it. As a major part of the future growth in tourism, Dubai is building Dubailand. This project is projected to be the most ambitious tourism, leisure and entertainment destination ever created. Dubailand will have different themes namely: Attractions and Experience World, Sports and Outdoor World, Eco-tourism World, Themed Leisure and Vacation World, Retail and Entertainment world and Downtown. It will be built in four stages, the first of which is already well underway, with completion of the entire project expected by 2020. 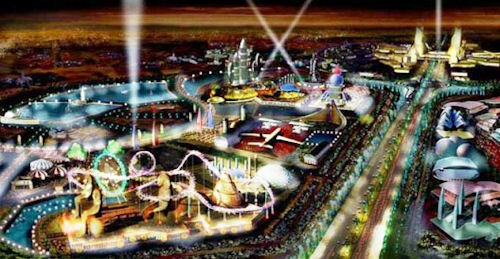 Dubailand will be more than twice the size of Walt Disney World in Orlando, Florida. Sheik Mohammed bin Rashid Al Maktoum rules Dubai as its prime minister of Dubai. It has been predicted that by 2010, there will be about 15 million visitors to Dubai and as many as 40 million visitors by 2015. Dubai spans 1,510 square miles. Dubai’s coastline stretches more than 72 miles. The total area is almost 2,428 square miles. Sales of oil constitute 6% of Dubai’s economy. International investment is the basis of the economy. Dubai has one of the highest per capita incomes. Although Dubai owes its initial wealth to the discovery of oil in the 1960s and this was the major contributor to the GDP, today oil only contributes 10% of the total GDP. 90% of the GDP is from the non -oil sector. More than 82% of the population are foreign workers from India, Pakistan and the Philippines. Seven Emirates make up the United Arab Emirates. Abu Dhabi, Dubai, Sharjah, Ajman, Umm AlQuain, Ras Al Khaimah and Fujeriah. 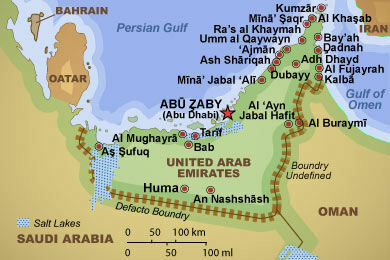 The United Arab Emirates is located at the base of the Persian Gulf in the Middle East. Want to know more about Dubai and the condo hotels being built there?